Signing free-agent forward Alexander Semin wasn't a decision Carolina Hurricanes general manager Jim Rutherford made lightly. In fact, he started doing his homework on Semin before the former Washington Capitals forward even became available. "I remember having a relatively long conversation with [former Capitals coach] Bruce Boudreau at the draft," Rutherford said. "That was the start of us really doing our homework leading to this signing." All the research done by Rutherford and his staff led to the Hurricanes signing the talented -- but enigmatic -- Semin to a one-year, $7 million contract Thursday. Semin's abilities on the ice are obvious. He's scored at least 25 goals in five of the past six seasons, topped by 40 in 2009-10, and three times he's scored at least 70 points. Though he's had just 54 points the past two seasons and scored only 21 goals in 2011-12, Rutherford said Semin's ability remains evident. "We had our pro scouting meetings and he was second on our free-agent list behind [Zach] Parise at the end of the year," Rutherford said. "And then what we do in-house with any player is we use analytics, and his numbers were extremely high. For his critics that don't do the same homework we do, those numbers would certainly indicate he's quite a bit different player than people suggest." It's off the ice where some critics have questioned Semin, including his work ethic and dedication. On that front, Rutherford also found a player he was more than willing to take a chance on. "Several people in our front office tried to reach out to as many people that have crossed paths with Alex in his career," Rutherford said. "Former players, former coaches, former scouts. You get different reviews from different people, but certainly the positives much outweighed any people that had a negative experience with him." Rutherford added that once Semin gets acclimated to the way things are done with the Hurricanes, there won't be any more issues. "We like to think that the way Kirk [Muller, coach] does things and with our approach and how our training camp is and how our practices are and fitting him in with Eric [Staal], that we can get that consistency out of him," Rutherford said. "And if we can, he's a guy that certainly is capable of getting back to the 40-goal mark." The one-year contract is perfect for the 2012-13 season, Rutherford believes, as it gives both sides a chance to evaluate the relationship. "It's a period of time for both the player and the team to figure out if this is the right fit for him," he said. "… I would like to think that he has good chemistry with our team, he likes living here like everybody else does, and this is just the start of a long-term relationship. "What's nice about what we did with Alex Semin is we got a talented player, we didn't lock in for a long period of time and then find out it's not working, and we didn't have to trade for him. Because we were involved in trade talks with other teams and we would have had to give up a lot of assets, and here we are sitting today with a very talented player -- an elite player -- and we didn't have to give up those assets. So I feel very good about that." "We were involved in trade talks with other teams and we would have had to give up a lot of assets, and here we are sitting today with a very talented player -- an elite player -- and we didn't have to give up those assets. So I feel very good about that." Rutherford said he went into the summer looking to add one top-six forward to a team that last season was 16th in the League at 2.58 goals per game and 20th on the power play at 16.7 percent. He accomplished that at the NHL Draft when he traded for Pittsburgh's Jordan Staal. Adding Semin exceeded the GM's expectations and gives Muller more options when he constructs a forward group that includes Eric Staal, Jeff Skinner, Jussi Jokinen and Tuomo Ruutu. "When you look at the dynamics of our hockey club now, it's great that we've added Jordan and great we've added a special player like Semin," Muller told the Raleigh News & Observer. "There will be a lot of trial and experimentation that will happen. The fun part for us will be seeing what our makeup with our chemistry. "It's great to have a right-handed goal-scorer like Semin to balance out our lines. Who plays with who, this guy with that guy, can be sorted out in preseason. 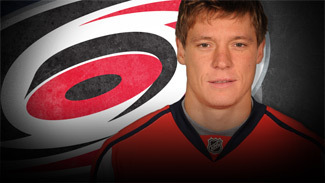 For us, having Semin adds another dimension to our lineup, with a right-handed shooter we know can produce. Whether he plays with the Staal brothers or splits time with them, we've got an elite player to play with them." Jordan Staal, who met the media in Carolina on Friday, said after playing against Semin, he is looking forward to being on the same side with him. "I know Alexander can really do some damage and play some great hockey," Staal said. "For myself, I'm just going to keep doing what I've been doing and hopefully keep getting better. Hopefully we can make an impact. Hopefully make the playoffs and do some damage." Rutherford wasn't ready to start predicting playoff success for his team -- the Hurricanes have been to the playoffs once since winning the 2006 Stanley Cup -- but said he believes the team he'll take into training camp is far better than in years past. "I will say we're a much stronger team going into the season than we have been in a long time," he said. "The thing we have a chance of doing that has been a struggle for us in the past is scoring more goals. If you play as many tight games as the Hurricanes have in the past and lose as many shootouts, we have a better chance of winning those games than we have in the past."